The expression of the soils conveys a subtle salinity to this wine. A deep dark, purple colour. An intense, fruity, powerful, spicy nose. A full entry on the palate and a complex finish with coated, fleshy tannins. The wine displays a deep colour, while the hot, sunny conditions of the vintage. The noble ageing of the wine come through again on the palate with hints of vanilla and subtle toast. This already expressive wine stillneeds some time to fin its harmonius balance. A very deep colour with a classy nose, characteristic of the place where the wine is produced.Oriental spices come through with black fruits aromas and hints of arre-cooked roasted meat juice. 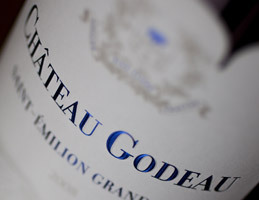 Powerful and rich on the palate , the wine has kept its youthful spirit. The colour shows the amazing depth of this wine for this vintage, and this justifies the degree of selection that was carried out. This is a great success for the 2013 vintage. Quite impressive colour and hue. Aromatic expression complexe and rich. Aromas come through of ripe raspberry coulis mingling with spice, juniper bush, humus and white flowers. A very lively palate and very harmonius finish. The colour is clean, clear and brilliant with a crimsom hue and bright glints.